Same old, same old - cow, caste, communalism. Did you vote for this? Only the results will give an answer. All those in Bihar who want development to be the end product of this bitterly fought elections for almost a month, would be disappointed to know that as the campaign progressed, it was hardly on the agenda of our politicians. As we wait for the results to put an end to all this on 8 November, we recall five statements made by key leaders, that summarise the issues that dominated the political discourse during the past two months. The comment made by the Prime Minister gave an indication of things to come - that the campaign would be a hard fought one, stopping at perhaps nothing. 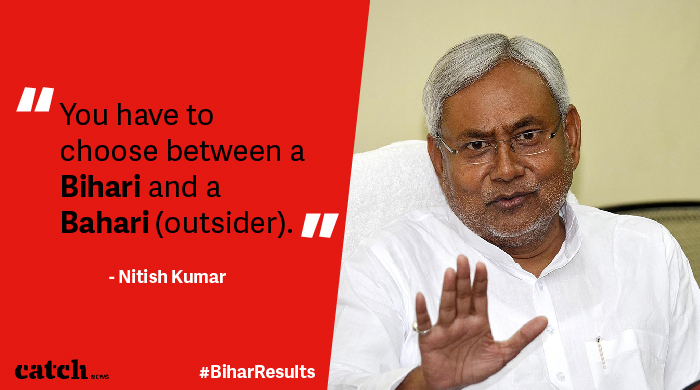 Though the jibe was primarily a personal attack, Nitish Kumar translated it into a matter of Bihari swabhimaan. 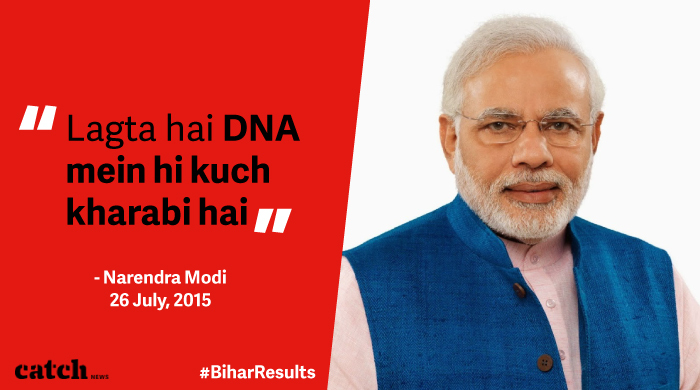 From writing an open letter demanding an apology, holding a massive Swabhimaan rally to collecting 1 lakh DNA samples, Nitish Kumar left no stone unturned to make the Bihar election an issue of Bihari respect and pride. And he succeeded in keeping the issue alive for quite some time. 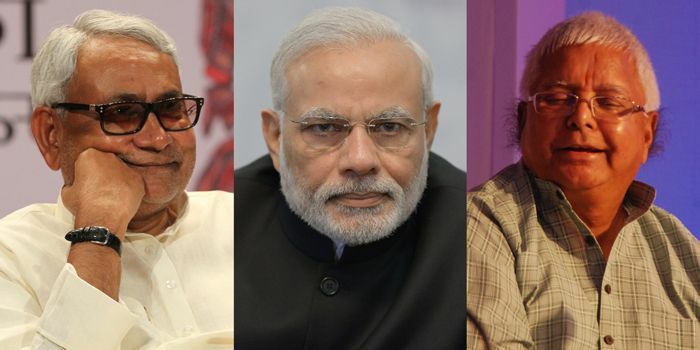 Prime Minister Narendra Modi announced the package at a time when the DNA debate had heated up, successfully blunting Nitish Kumar's attempt of playing it out. However, the way he announced the package invited much criticism. Kumar quite rightfully quipped: "Kya woh Bihar ki boli laga rahe the. 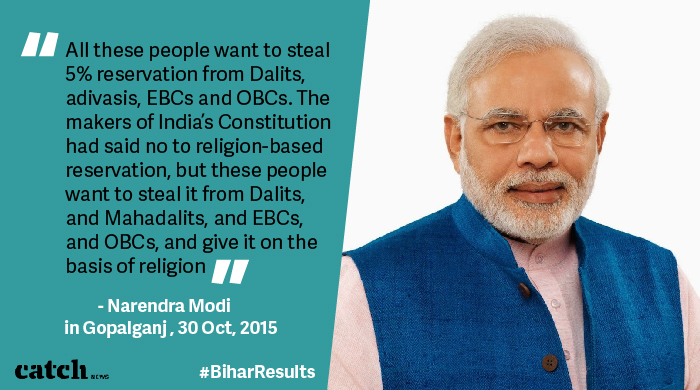 (It seemed as if he was auctioning off Bihar )"
Well, this statement pretty much changed the Bihar election narrative. Till date, it's not clear if the RJD chief Lalu Prasad Yadav consciously made the statement, knowing that elections were to begin in the state in just about a week i.e. 12 October. The context of the statement was the Dadri incident that happened towards the end of September in which a 55-year-old Muslim man was killed over rumours of killing a cow and storing beef in his fridge. The statement proved to be a turning point in the way BJP would take forward it's campaign henceforth. The after-affects of the Dadri incident could be felt in the poll-bound state. Modi latched on to "Hindus too eat beef" comment. 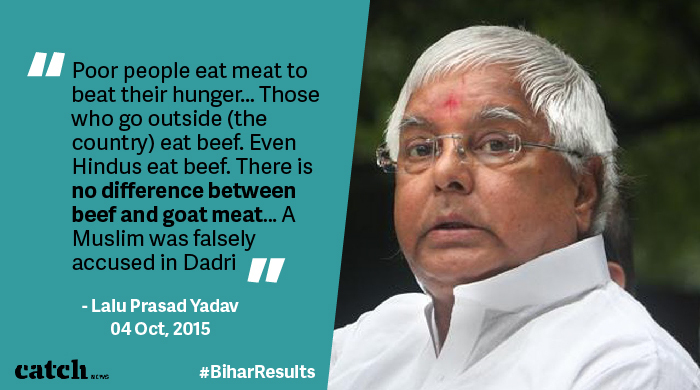 Invoking Yaduvanshis, he proved to Lalu what a terrible mistake he had made by jumping into the Dadri cauldron. Beef, by now, had become the sole poll agenda. The beef motif would be repeated time and again through the rest of the election campaign. In a brazen attempt to communalise the elections, the BJP even published ads related to cow protection, something for which they were reprimanded by the Election Commission. This comment was made when three phases of the election were already over, perhaps, earning Modi the harshest criticism. His critics said that it was not befitting of the Prime Minister to use such "divisive" language and pit one community against the other. This has been Nitish Kumar's line of thought through out the elections; only a Bihari and not a Bahari can win in the state. To this Modi said that if he was a Bahari, i.e. an outsider, what would he call Congress President and his ally in Bihar, Sonia Gandhi. Sadly, the Prime Minister forgets that Sonia Gandhi is not fighting for the CM's seat and that he is not campaigning for Lok Sabha elections. Just as Nitish forgets, Bihar is in India. Clearly, the more things change, the more they remain the same. TWEET THIS Same old, same old - cow, caste, communalism. Did you vote for this? Only the results will give an answer.